Women were active in the events surrounding the Islamic revolution in Iran 30 years ago, but the Islamic Republic has been criticised for reversing many of the rights women won under the Shah's regime that was overthrown by the revolution. 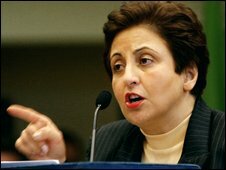 Iranian lawyer Shirin Ebadi was awarded the Nobel Prize in 2003 for her work on human rights in Iran. 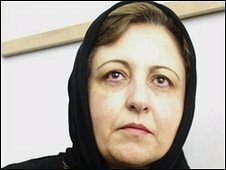 She tells the BBC World Service how women have responded to changes in their legal status over the past 30 years and how her hopes for Iran's future lie with women and the young. The slogan of the revolution was 'Independence and Freedom' and they said that the Islamic Revolution would bring this. Back then people were really hopeful because they really wanted independence and freedom. Unfortunately after the revolution, while the country was more independent than before, the freedom that people were expecting did not come about. Only five months had passed since the revolution when the Revolutionary Council took away all the rights that women had won over the previous years even though the new constitution had yet to be passed and the new president had not been elected. It was in 1979 that a law was passed allowing men to take up to four wives, another law was passed stating that after a divorce the father would have custody of the children and women lost the rights they had gained. At that point I realised that before even laying down the new constitution they went after women and took their rights away. I was very supportive of the revolution while it was taking place. I was a judge. However, a few months after the revolution they told me that I could no longer practice as a judge as it is illegal for a woman to be a judge under Islamic law. Myself and other female judges were demoted to mere clerks. The important point is that the legal rights given to women such as my right to be equal to my husband within the family, as well as other laws in favour of women were changed. I felt that I had been made into a second class citizen. The revolution caused women to go back a few steps under the law, but this only made women work harder to regain their rights and to prove themselves. Women made up a quarter of university students under the Shah, but today 65% of our university students are female. The number of educated women after the revolution rose noticeably. And an educated woman who goes to university will one day be able to regain her rights. My hopes for Iran's future lies with women first and foremost and then with young people. Iran's feminist movement is very strong. This movement has no leader or head quarters. It's place is the home of every Iranian who believes in equal rights. This is currently the strongest women's movement in the Middle East. I also have faith that Iran's young people will correct the country's problems. Around 70% of Iran's population is under 30 years old and there is great potential for building a prosperous and free Iran. US- Iran: Dialogue of the deaf?